Whether you are a new parent or an experienced caregiver, your child’s oral health is an important aspect of their overall health. These quick and easy tips will make it easier to keep their mouth happy, and their smile sparkling. Don’t even THINK about trying to come between her and her toothbrush! Starting to clean your child’s mouth even before they have teeth helps to build the activity into a routine. An easy way to do this is to clean their mouth by running a clean, soft cloth wet with warm water over their gums and cheeks. Doing this helps to get rid of any food particles and sugars left behind from meal time and also gets the child used to having their mouth cleaned daily. Discouraging grazing on sugar-filled foods or sipping on sugary drinks between meals is a great way to protect your child’s teeth against excess sugar and acids. Of course, permanently substituting these with water and vegetables makes for healthier choices for both the mouth and body, so we’ll always advocate for that! When your child does start growing teeth, they will not have the motor skills to use a toothbrush so you will have to brush their teeth for them. The easiest way to do this is to put the child in a reclined position while you use a soft bristled toothbrush to get rid of food particles and sugar. The most effective way to brush a child’s teeth is to hold the bristles of the toothbrush at the gumline for a few seconds then sweep down the tooth in a downward motion. When the child is able to hold a toothbrush on their own, guide the toothbrush around their mouth with your own hand to get them used to the proper technique. Brushing with them in this way makes it a learning activity that you can do together. When the child is able to brush their own teeth effectively, brush your own teeth beside them to make it something that you can do together twice a day. Participating in your child’s oral health and setting an example is the most effective way that they continue to brush their teeth and enjoy doing so. Flossing is important… and easy! When your child has more than one tooth, it’s important to start flossing them. And there’s an easy way to do so: Wrap a piece of floss about as long as your child’s arm around your two middle fingers, and hold it firmly taut. This way, you can guide the floss between the teeth with your index fingers. Once the floss has reached the gum line, wrap the floss around the tooth in a ‘C’ shape and pull it out from between the teeth. If you’re looking for a snack that will keep both your child and their mouth happy, cheese is a great option (within moderation, of course). The calcium in cheese promotes remineralization, which strengthens tooth enamel, and cheese stimulates saliva production in the mouth, which can help to get rid of unwanted sugars stuck to teeth. Effective brushing takes about two minutes, so to make the time go by faster and to add some fun into you and your child’s dental routine, play some music! 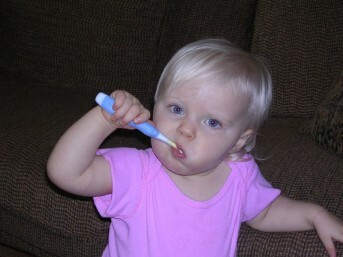 It’s a great way to make the activity more enjoyable and help your child to look forward to brushing twice a day. A little goes a long way with young ones. For children between the ages of three and six, the use of a small amount of fluoridated toothpaste is recommended. 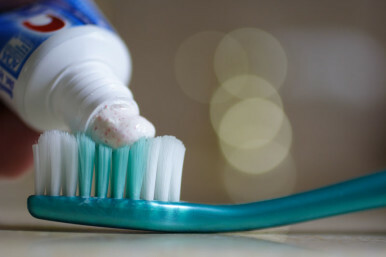 Fluoridated toothpaste helps to make teeth more resistant to tooth decay, something that baby teeth are very prone to. No more than a pea-sized amount should be used, but even this small amount can still have a huge impact in protecting teeth. For children who do not enjoy brushing or who fuss at the thought of doing it, buying a special toothbrush in their favourite colour or with their favourite cartoon characters on it can help to make the experience more fun. You can even have a few different brushes available to you child so that when it comes time to brush they can choose which ones they want to use, making the process something that is their choice rather than a necessity.